One of my favorite things I get to do as part of my job as a Health and Wellness Coach at the DAHLC is to teach foam rolling. I first started foam rolling about 10 years ago after a friend from Chicago called to tell me about this great new thing she was doing with her adaptive clients. I immediately ordered my soft, red foam roller from a sporting goods catalogue. I had just begun training hard for triathlons and my legs were chronically sore. I started by rolling out my quadriceps and my upper back most days a week for about a month. I could only stand to roll up to 10 minutes a day. After a month or so, my quadriceps did not scream with pain while foam rolling, or even after a day of hard training. Amazing! I’ve been an avid roller ever since. My technique has changed over the years as have the products. Now I use a much denser roller, a tennis ball, and a stick to do the same foam rolling technique that had me at quadriceps years ago. 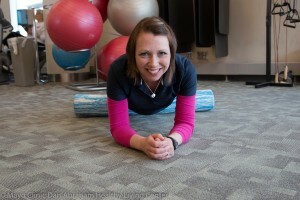 **Foam rolling is one way to do a technique called self-myofascial release. For more information, please see this video https://www.youtube.com/watch?v=Kbrv3ApIa0k explaining the technique and this video https://www.youtube.com/watch?v=5AM9DkYVGfw for tips on rolling out your large muscle groups. Happy rolling! How does it work? Fascia covers your muscles and may become knotted or tight. These areas are referred to as areas of tenderness. These areas of tenderness are thought to "release" when pressure is applied to the area, similar to deep tissue massage. To perform Self Myofascial Release: Make slow, short, rolling movements. When you find an area of tenderness, hold the position until the muscle releases (30 seconds or so). Visualize your muscle releasing over the roller. NEVER roll directly on bones or joints. ALWAYS roll on muscles and soft tissue. Self-myofascial release works best, as many exercises do, by consistent use.